The Camino’s markings are getting better. The paint looks fresher. There are fewer gaps and more signs. The trails are better taken care of. Something changed from Montpellier onward. Perhaps that is the start of many people’s journeys and not just another day among hundreds. I still haven’t seen a single other hiker. I haven’t even recognized footprints in the dirt. Saint Guilhem le Désert is full of shells. They’re painted on doorways, walls, and shop windows. They hang from signs and adorn restaurant menus. They are everywhere. It’s the first town that seems given over to being on the Camino. 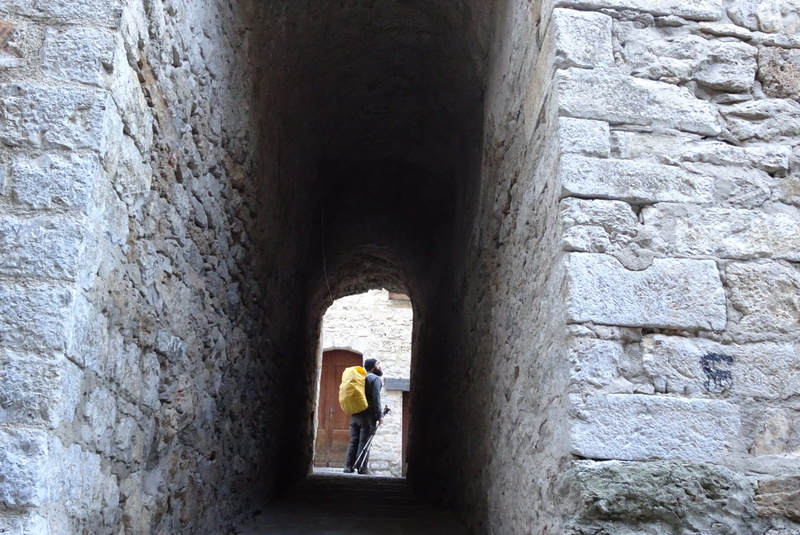 The narrow streets are beautiful, twisting through lines of old buildings, underneath archways, and into the town square built around the abbey. It seems a sleepy place, pieces forgotten in time. I walk through it, following all the shells, feeling like I am on the Camino, but not quite part of it, not woven into its fabric. I don’t know the culture of this trail. I don’t know its traditions or customs. I feel like an imposter, like I’m reliving those first days on the Appalachian Trail so long ago. It feels silly, after so many miles, to feel out of place on a trail again, but this isn’t an American trial, it isn’t hiker-trash, nobo, sobo, game, mega, trail angels, white, blue, yellow, and red blazes. There’s no flip-flopping, zeros, neros, and heroes. People don’t go by names like Out of Order, Moon Pie, Sweep, Breeze, Girlscout, Fester, Wilderness Bob, and Waterfall. It is a different kind of trail and I feel like an old man shoved into an unfamiliar place. It didn’t matter on the E1. That trail has no culture of its own. People hardly know it exists. It is a blank slate. The Camino is different. Its history stretches back centuries. Millions have stepped on its paths. It has a culture all its own that soaks across it and I don’t know more than that it exists. On the far edge of town, I look up at huge cliffs of white and yellowish rock rising above the narrow valley. The trail breaks off from a road and begins a long switchbacking climb up to the top. Back and forth, back and forth, back and forth it climbs, sawing up the valley wall. Sweat runs down my back, my breath keeps time, my legs chew up the distance as if it were flat until I stand on top and peer down at the valley floor. Some things don’t change no matter how they are marked. Shells or blazes or nothing at all, a step is a step, a climb a climb, like old friends I’ve met a thousand times before. Posted in Europe North to SouthTagged appalachian trail, Camino de Santiago, ENS, Europe North to South, featured, FranceBookmark the permalink. 🙂 , you are a very good and detailed writer. Your stories are fun and interesting.